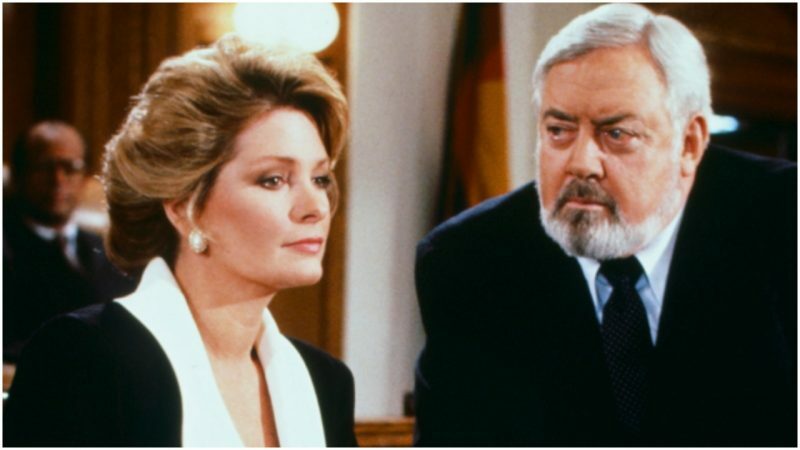 The most popular legal drama in television history was Perry Mason, starring Raymond Burr as the brilliant defense attorney who won practically all his cases. After an Emmy Award-winning nine-year run, the CBS series was canceled in 1966 but found immortality in syndication. The series’ episodes followed a tried-and-true formula. With the help of his investigator, Paul Drake (William Hopper), and secretary Della Reese (Barbara Hale), the dignified and unflappable Mason took the cases of the wrongly accused, only to unmask the identity of the true criminal on the witness stand through relentless cross examination. “Yes, yes, it was me — I killed him!” the guilty would cry out, flustered by Mason’s clever cat-and-mouse tactics. 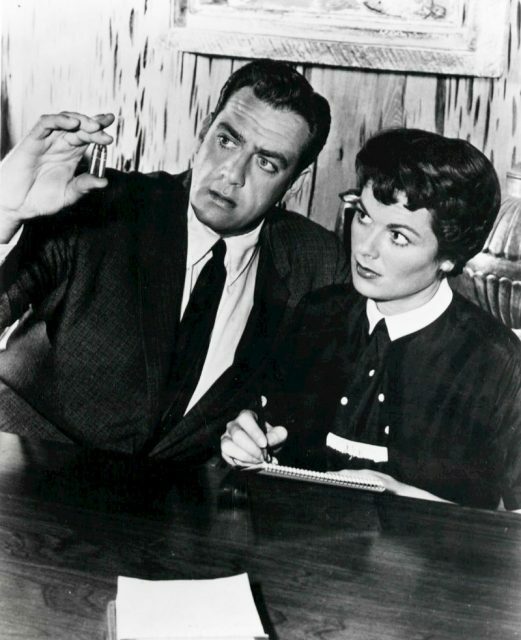 Perry Mason (Raymond Burr) and Della Street (Barbara Hale) in “The Case of the Corresponding Corpse” (1958). In January 2019, a new Perry Mason series was announced, this one for HBO. 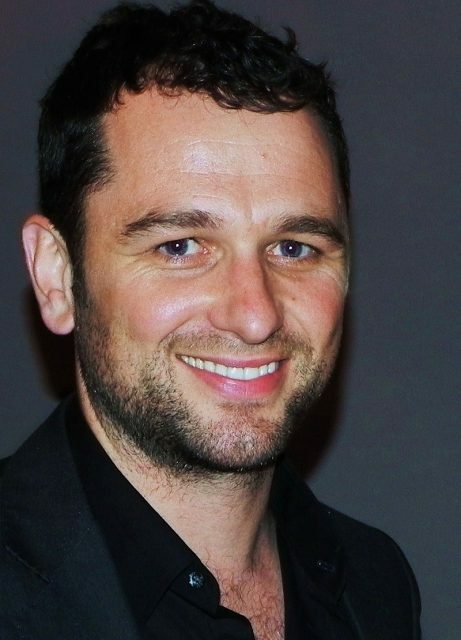 Mason will be portrayed by Matthew Rhys, who recently finished a successful, award-winning series of his own: The Americans. In it, Rhys, who is Welsh, played a deep-cover Russian KGB officer who, married to a fellow agent, lived in the Washington, D.C. area in the 1980s, carrying out murderous spy missions while pretending to be an ordinary suburban husband and father. 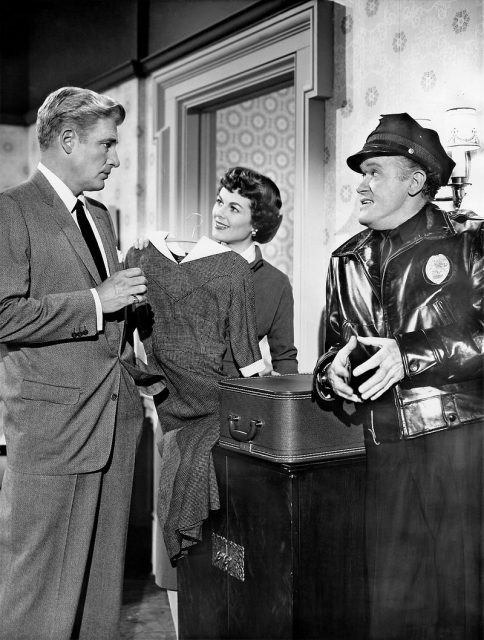 Paul Drake (William Hopper) and Della Street (Barbara Hale), with cop Frank Sully. While this may sound like a far cry from the CBS series, it is arguably circling back to the original Perry Mason crime novels written by Erle Stanley Gardner. Described as “the master of American mystery fiction,” Gardner wrote 146 books, 85 of which featured Perry Mason. While he is not well known today compared to Raymond Chandler, James M. Cain, or Ross Macdonald, at the time of his death in 1970 Gardner was regarded as the best-selling American writer of the 20th century. 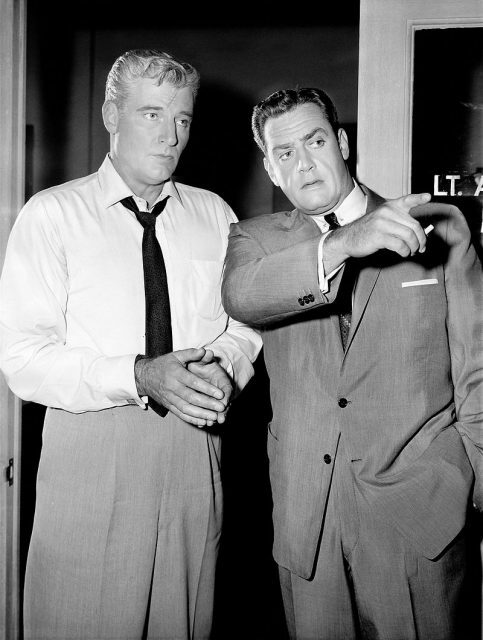 Paul Drake (William Hopper) and Perry Mason (Raymond Burr). Gardner went to law school and practiced law in California but was drawn to writing, and in the 1920s spent much of his time contributing to pulp fiction magazines. His first Perry Mason novel, The Case of the Velvet Claws, was published in 1933. In it, Mason has a few rough edges as he maneuvers to win his case. Burr and Joan O’Brien in “The Case of the Singing Skirt” (1960). 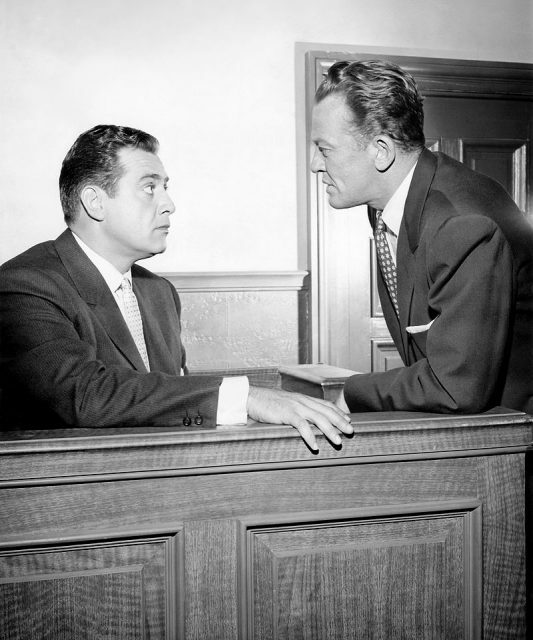 Perry Mason (Raymond Burr) and Hamilton Burger (William Talman). The many Perry Mason books were adapted into six films in the 1930s and then radio serials in the 1950s. 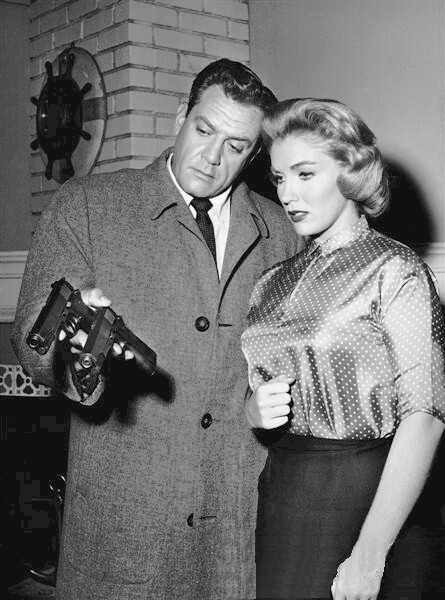 When CBS decided to turn it into a one-hour legal drama, Raymond Burr auditioned for the part of the district attorney, but he impressed the producers so much he was cast as the lead. From 1967 to 1975, Burr played another popular crime-solver in the series Ironside. And in the 1980s he re-created his Perry Mason role in several made for TV movies. The HBO version of Perry Mason was originally envisioned as a feature film. Robert Downey Jr. was planned as the lead before the producers changed direction, casting Matthew Rhys in a limited-run TV series. Downey will executive-produce the HBO series.